My music collection is too big to browse in Apple’s Music app. With over 15,000 songs, browsing by track is out of the question, and because I have only one or two songs by many artists, scrolling my entire artist list is impractical too. As a result, I typically use search to find songs in the Music app. The trouble is, search only works if you already know what you want to hear, and it hampers rediscovery of music you haven't listened to for a while. Apple Music’s algorithmically-generated ‘My Favorites Mix’ helps with this, but sometimes I would rather discover old favorites on my own. For those times, I turn to Picky by Charles Joseph. 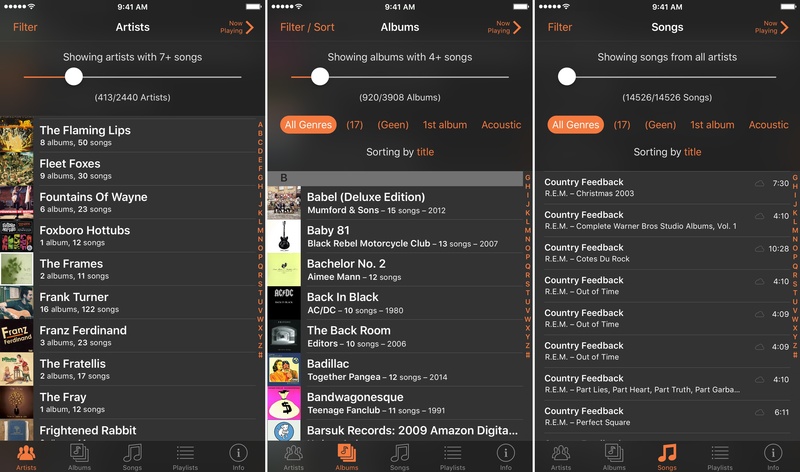 Picky lets you filter and sort music in more ways than you can probably imagine. 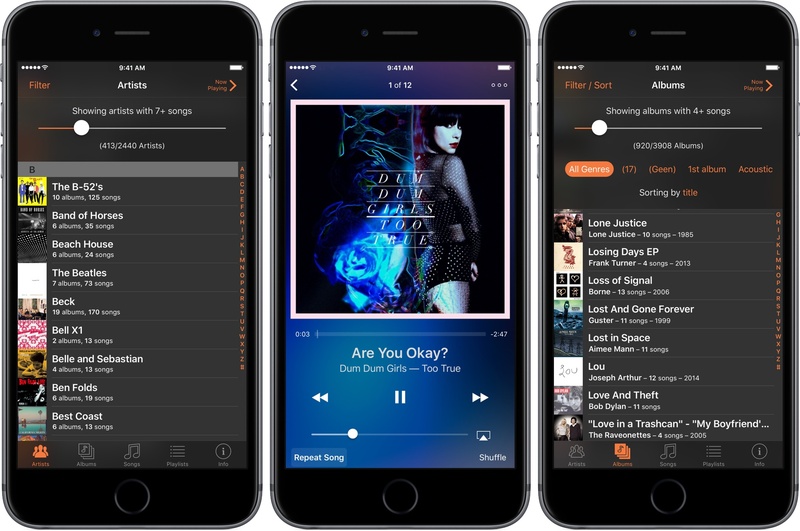 Add to that the ability quickly queue up songs from anywhere in the app, and the result is a powerful music utility that is perfect for getting reacquainted with your favorite tunes. Artist, Album, and Song filters. Picky is unapologetically a browsing app. You won’t find a search box anywhere. Instead, the app is divided into four main tabs: Artists, Albums, Songs, and Playlists. Browsing each tab is tailored to its content. The Artists tab has a slider for narrowing the list according to the number of songs by that artist in your library. Moving the slider back and forth is eye opening. Of the over 2400 artists in my library, fewer than half have two or more songs. If you have a lot of one-off songs by artists like I apparently do, the slider is an effective way to narrow down the list to artists with the most songs in your collection, which should be a good approximation of which are your favorites. Albums and Songs work similarly. The Albums section has a slider that restricts the list to albums with a minimum number of songs. You can also narrow the list by picking from a horizontally scrolling list of genres. My genre tags are a mess, so this filter was less useful to me than others but should be great for anyone who meticulously maintains their ID3 tags. In addition to filtering, albums can be sorted by title, artist, release date, date added, or duration. The Songs view includes a slider that hides artists with more than a certain number of songs and, like Albums, has genre filters and similar sorting options. The Playlists view is the only one without filters or sorting. Instead, playlists are organized into Genius Playlists, Smart Playlists, and Standard Playlists. Adding songs to your queue and the 'more' menu. Picky’s utility doesn’t end when you’ve found what you’re looking for. Throughout the app, you can build a listening queue by swiping left on any entry whether it’s an artist, album, song, or playlist. As you do so, a plus icon appears and animates from an outline to filled-in as you continue to swipe left, which is a nice confirmation that an item has been added to your queue. When a group of songs is displayed on-screen, like an album, you can alternatively tap a ‘Picklist’ button, which lets you rapidly select and queue the tracks you want to hear. When you’re ready to listen to your queue, tap the ‘Now Playing’ button in the top right-hand corner of the app. The player slides in from the right with the controls you expect from a media player, but with additions you won’t find in Apple’s Music app. For instance, you can swipe right on the album art to restart a song or left to skip to the next song in your queue. There is also a three-dot ‘More’ button in the top right-hand corner of the player that opens a sheet of buttons to jump to the album being played, view lyrics, share the current song, view your song queue, or clear your song queue. The ‘more’ button provides useful functionality, but it has some limitations, and there are things I would like to see added. Lyrics can be accessed with the ‘More’ button or by tapping the album art. In my testing, however, I was unable to find lyrics for any of the songs in my library of owned music or songs stored online, even though lyrics were available for those songs when I checked in Apple’s Music app. I tried everything I could think of but was never able to get lyrics to work. One of the things that Apple’s Music app gets right is sharing, which is easily accessible from different parts of the app. 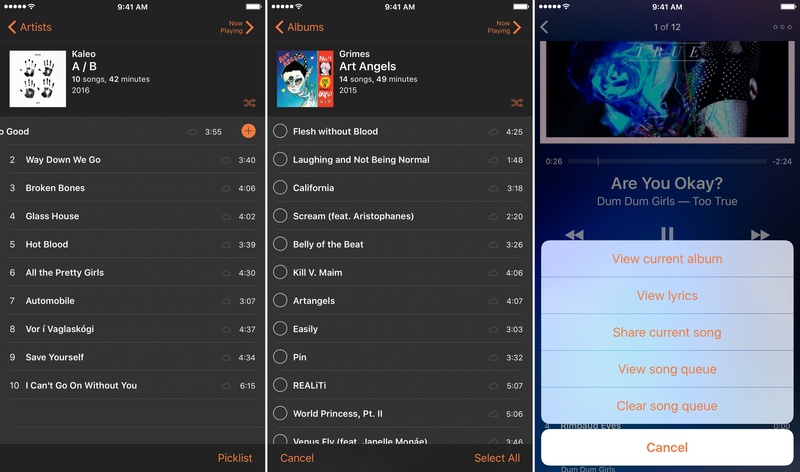 Picky provides access to the share sheet from the ‘Now Playing’ screen and, whereas Apple Music only provides a link to the song shared, Picky includes the name, artist, and album information. That’s a nice addition, but Picky doesn’t include a link to Apple Music or any other streaming service or store, which is something I’d like to see added. Your song queue can also be accessed by scrolling up to reveal the queue. From the queue, you can swipe left to remove a song or skip ahead by tapping a song, but there is no way to rearrange the queue manually. I would also like to see Picky add that, the ability to jump from the song that is playing to the artist view using the ‘More’ menu, and an option to turn a Picky play queue into a saved playlist. Picky can be customized in settings. The player is dynamically colored based on album artwork, though you can turn that off if you prefer a plain black background. There is also a dark mode, which is my preferred theme and what you see in the screenshots throughout this review. Whether you show cloud-based music in Picky is an option that is turned off by default. I turned cloud music on because that’s where most of my music resides, but I understand why it’s not the default. Each time your library changes, the list of your cloud-based music has to be loaded into Picky, which can take several seconds. It’s not a great user experience, but I suspect it’s necessary given how Apple’s APIs work. Picky is sold as a separate iPad app. The differences between it and the iPhone version are minor. Picky for the iPad uses the additional space to include an always-present mini-player to the top of the screen, which opens into a popover player view similar to the iPhone interface when tapped. It’s a nice addition to the iPad app, but there is still a lot of unused space in the list views below the mini-player that could be used better; perhaps by dividing it into a multi-column view for browsing your library and viewing your queue at the same time. I ran into a few minor bugs using Picky, but none were show-stoppers. If the Apple Music app’s repeat song feature is turned on, Picky sometimes repeats songs even if the same feature is turned off in Picky. In addition, the play indicator next to a song in the queue sometimes appeared next to the wrong song after I edited my queue. Deleting songs from the queue occasionally made the current song start playing from the beginning too. Navigating thousands of songs to find what you want to hear poses a difficult design problem. Apple’s Music app tackles the problem with search. That’s a clean, uncluttered way to find music, but the simplicity comes at a cost. Search requires that you know what you are looking for, which eliminates serendipitous discovery. Apple addresses discovery in other ways to varying degrees of success through its ‘For You’ and ‘Browse’ functionality, but it doesn’t do a very good job with the rediscovery of your existing music library, which is not surprising given Apple’s focus on its streaming service. Still, the best-curated playlist of favorites is often the one you create yourself. That’s precisely how I use Picky; not so much as a full-time alternative to Apple’s Music app, but as a supplement to it when Apple’s algorithms fail me. There are a few rough edges in Picky, but the utility of being able to filter and sort a large music library and quickly queue music for playback is clear and outweighs the handful of issues I experienced. If you’ve ever felt constrained by the way Apple Music lets you navigate your music library or just want more ways to rediscover your favorite songs – if you’re picky about your music collection – give Picky a try – it’s a great option. Picky is available on the App Store as separate apps for the iPhone ($2.99) and iPad ($3.99).